Remember how cool Australia was when Pokémon Go launched? What’s been happening in the Sydney suburb of Rhodes this week has been a little less pleasant. Some background: Rhodes is a suburb with a ton of high-density apartments, all clustered around the waterfront and a big IKEA/shopping mall. When Pokémon Go was released last week, a combination of the high population density and a number of Pokestops in the suburb’s Peg Paterson Park meant that it was one of the best (and most popular) places in all of Sydney to catch some pocket monsters. 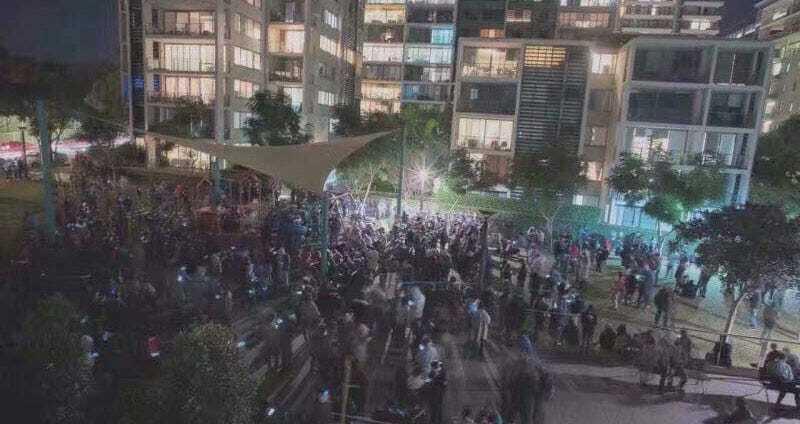 Massive crowds, sometimes peaking at over 1000 people, have flocked to the park, often late at night, and after a few evenings of this noise and bustle the residents of the apartment buildings overlooking the action have had enough. On Tuesday night, things came to a head. Buzzfeed reports that at some residents—reacting to the “complete chaos” and “massive levels of noise”—started throwing waterbombs and eggs at the crowd. The police then turned up, issuing tickets to illegally-parked cars just outside, then warning the crowd that they’d have to disperse or face AUD$200 fines. Which is maybe understandable! Yes, it’s a public park, but considering its location (surrounded by apartments) and the number of players involved that’s a lot of noise being made and a lot of people being kept up in the middle of the night. To maybe help chill things out, last night someone was there handing out drinks and sausage sandwiches (Australians love some sausage-in-bread), while Sydney’s Pokémon Go Facebook group is doing a good job of policing some of the fallout. The park is of course still open to players in more civilised hours. Indeed, the local deputy mayor says that extra rangers and waste collectors have been assigned to cope with the hotspot. “The new game provides a wonderful opportunity for people to enjoy the parks, foreshore and other open areas around the City of Canada Bay in a fun, interactive way but we ask people to do this in a safe, considerate manner,” she told the Sydney Morning Herald.